"Just wanted you to know how pleased we are with our new roof from Weather Master Roofing...WeatherMaster did an exceptional job in a timely manner. From bidding to completion everything went without a hitch." "Weathermaster Roofing was a life saver for me... Chris came in with a practical and durable solution and did the job for a fraction of the other quotes." "When we moved to a new home, we found a company to add solar heat to our pool. They ended up poking holes in the wrong part of the roof among other mistakes... When WeatherMaster did the work for our new solar electric system we new we would have no problems and that the work would be top notch." 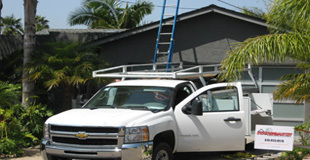 For the past 23 years, Chris Wilder, owner of WeatherMaster Roofing Services, has been providing roofing solutions for hundreds of San Diego homeowners and businesses. At WeatherMaster we believe that "Quality is top priority". WeatherMaster only uses the finest materials that are backed by financially stable material manufacturers. We also only employ the finest installers with verifiable knowledge and schooling. Keeping in mind that every job site is supervised by the owner.You will be dealing directly with the owner, Chris, from the time we come out to give you a "free-no hassle estimate", all the way to project completion. A showcase of some our most recent projects. Installing projects with precision and excellence is our primary focus. How we approach our projects and interact with our clients. We start with our "free-no hassle estimate"